PSSI Global Services has been awarded a Technology & Engineering Emmy® Award for the company's work with NASCAR to develop cutting-edge transmission schemes for large-scale “at-home” productions. Presented by the National Academy of Television Arts & Sciences, the award recognizes PSSI Global Services’ significant accomplishments in broadcast technology and television engineering. While broadcasters have been producing at-home events for many years, PSSI Global Services’ award-winning transmission innovations have enabled much larger — and more complex — at-home productions than ever before. These technological advancements significantly reduce costs and simplify logistics for major live television events by eliminating the need for extensive on-site production crews. PSSI Global Services’ engineering team has made unprecedented strides in developing new techniques in video compression and modulation to maximize data throughput at extremely low latency through traditional amplifier and antenna configurations for satellite transmissions as well as for fiber and IP distribution platforms. 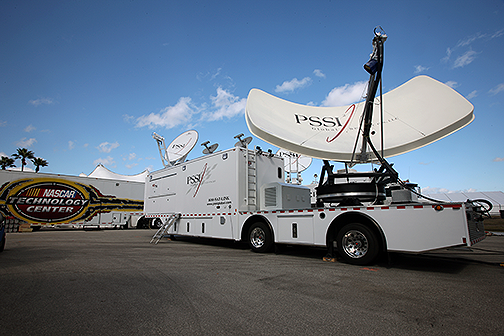 In early 2018, PSSI Global Services used these transmission capabilities in partnership with NASCAR to successfully conduct the largest at-home production to date for the Rolex 24 in Daytona, Florida. The transmission from the event back to NASCAR’s headquarters in Charlotte, North Carolina, included 28 video paths and 75 channels of audio delivered synchronously for 32 consecutive hours. To accomplish this groundbreaking at-home transmission, PSSI Global Services needed just two transponders on a single satellite, accessed with one antenna and one solid-state amplifier. PSSI Global Services will be honored alongside NASCAR and the year’s other Technology & Engineering Emmy Award Winners on April 7, 2019, during the National Association of Broadcasters (NAB) show in Las Vegas, Nevada. The company's EVP, Brian Nelles, said that receiving this Emmy is a huge honor for the company and this is the result of a tremendous amount of hard work and dedication. The PSSI Global team invested countless hours and hundreds of thousands of dollars in developing this solution for clients’ large-scale at-home production needs and the company is proud of the results. Director of Broadcast Sports, Rick Ball, added that with the firm's large-scale at-home capabilities, PSSI Global Services has fundamentally changed the way the industry looks at producing live events. By combining the correct mix of technology, workflows and engineering expertise, the firm's clients have been given the ability to produce large-scale events much more conveniently and cost-effectively.